It's Friday night and we tend to stay in on Friday's, it's often our Wii night. After a long week, it's can be a tough night to go out; bars are packed and we are usually worn out from the week. So this is a great night to stay in, make a little dinner, have a simple drink and play some Wii. It's also our chance to catch up from the week and plan the weekend, sort of a re-grouping. And even though Dave is not a great fan of fish, this does seem to become a fish night for us- very similar to the classic Friday night fish fry's in the Midwest- only we make it much healthier. I've been on a Mahi Mahi kick lately and tonight is no different. Dave is a big fan of spinach and wanted sauteed spinach as well. So I started with red onion and celery in olive oil, added the fish with a bit of lemon pepper, then mixed a little soy-mustard sauce and added that and spinach to the pan. A gorgeous dish that is healthy and tasty with plenty of protein for hours of Wii play! Whether your heading out for a night on the town or planning on an evening in- enjoy and be fat and happy! Slice a quarter of an onion, place in a pan over medium heat with a few tablespoons of olive oil. Add 2 chopped stalks of celery. 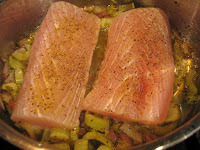 Now add the fish to the pan with the lemon pepper, cover and simmer until the fish is near opaque. Quickly wisk together grainy mustard (1/4 cup), soy sauce (1/8 cup) and red wine vinegar (2Tbls), pepper and olive oil (just to mix). Add the spinach and the mustard sauce. 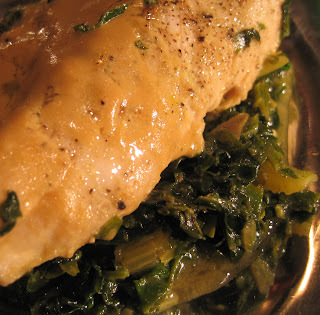 Cook until the spinach is wilted and the fish is flaky and white. To plate, place the spinach on the plate first and top with the fish. I found a gin tonic with extra lime quite nice with this. Now go play Wii and beat your mate!